Renault Sandero is Renault’s latest hatchback model that was launched in the recent Frankfurt Motor Show in 2008. It promises to be a runaway success like Logan in the Indian car market. The company has finally given a green signal and confirmed that the model will be launched in India in 2009-10 fiscal year. The company originally intended to build the car from Renault-Nissan’s manufacturing unit in Chennai but now it may build the car in association with M&M at their Nashik facility. 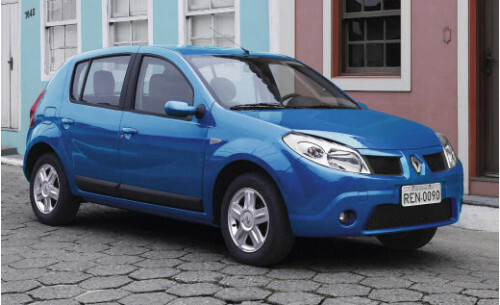 Sandero is a small hatchback model from Renault with all the ingredients to become successful in the India car market. It is four meters in length to avail the excise duty benefits of the small car. It had been originally designed to suit the expectations of the South American customers but that does not prevent the model to become successful internationally. The back has a typical Maruti Swift look but overall the car has everything that it needs. It has style, quality and mark identity from outside and has clean, comfortable and spacious interiors. Currently, the car comes with 2 petrol engines - 1.0L petrol and 1.6L petrol and 1.5L Diesel engine. What remains to be seen is the final Indian version of the car when the company finally launches the model in India. The company has not given a final launch date so far!